The beach was only a few steps from the hotel, so while the bike was in transit I passed some time walking on the beach. 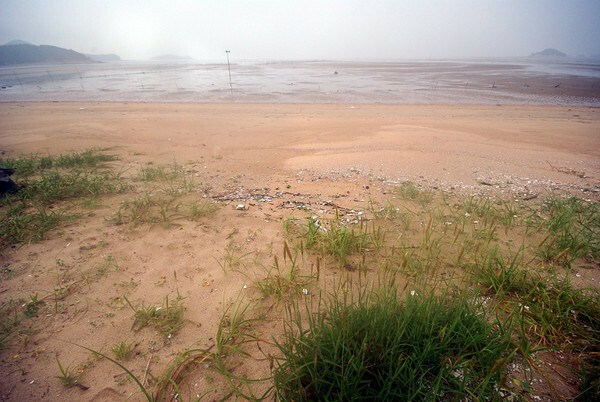 This was a quiet family vacation spot, with long tidal flats instead of bodacious breakers. 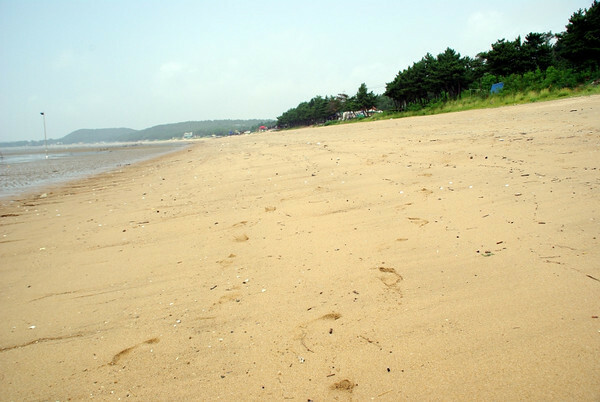 Beach on south Incheon island, Korea. Along the shore were small shops, ATV-rentals and restaurants where whole fish were cooked on in-table grills. On Sunday, I went to Korean Air Cargo where I met J.C., whose mastery of English was a huge help in getting through the importation process. We visited several customs offices, and the huge rulebooks were opened and several phone calls made. Since it was Sunday, the customs offices were running only skeleton crews, so expertise on vehicle importation (by air) was thin on the ground. Eventually we had a plan: On Monday, I would go to Incheon City Hall for temporary tags and insurance. After navigating the subway system (easy with English signs and station announcements) to Incheon City Hall, I was directed to the district office where traffic issues were handled. Once there, the very helpful employees called several insurance companies for me, searching for one that would sell me a short-term policy. During the lunch hour I wandered into China Town and promptly got lost, rushing back to the traffic offices dripping in sweat. At 4PM I had the golden temporary plates (they really are on gold-colored paper), and proof of insurance. These were the keys to getting the moto from customs. Tuesday found me back at Korean Air Cargo, who walked me to the office of customs broker Mr. Choi, a former long-time customs officer who had assisted U.S. President Gerald Ford in a visit to Korea, China and (then) U.S.S.R. 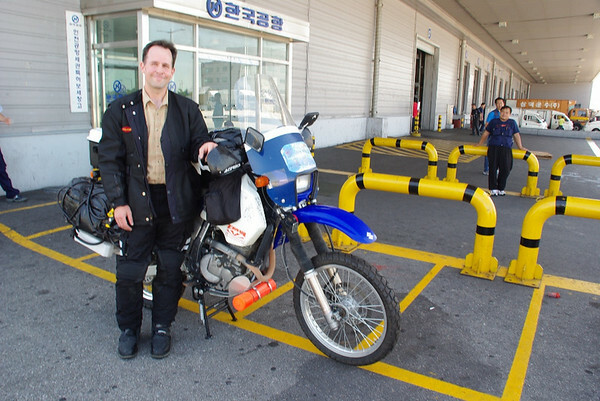 He smoothly navigated through more customs mazes, and just before noon, the crated bike was brought out by fork-lift. I jumped to uncrating and bike re-assembly with vigor, much to the enjoyment of customs employees who were taking smoke breaks. Finally at 2PM, I pressed the starter button, and sped off into the hot honking mid-day crush of Incheon traffic. After 7 nights in 4 different hotels, I'm ready to ride again! I spent two hours getting lost in Incheon traffic before finding my road east, and spent two more hours along non-stop urban developments. I finally stopped for the night at a “love motel” near Yeoju. #1 | Written by LeeAnn and Paul about 9 years ago. #2 | Written by Auntie Tamara about 8 years ago. I want to know what a “love motel” is too!!! !